OverviewTechnology transfer is an alternative way to improve and adopt technologies from others with low risk, and is an easier way to enter a specific market, reducing the R&D period. With a rapidly changing global economy from year to year due to the growth of technology, short product life cycle, and globalization, technological innovation has become more important for business firms to adopt from related industries. It has become one of the most significant factors for a firm to consider when making a business decision. For any business firm, acquiring innovative technologies can be an asset of a firm’s long term success to expand in competitive global markets. Self-R&D strategy is a good option in creating technology innovations such as patents and processes. However, it is time consuming, expensive, and risky as it is impossible to take back the resources used in case of failure. 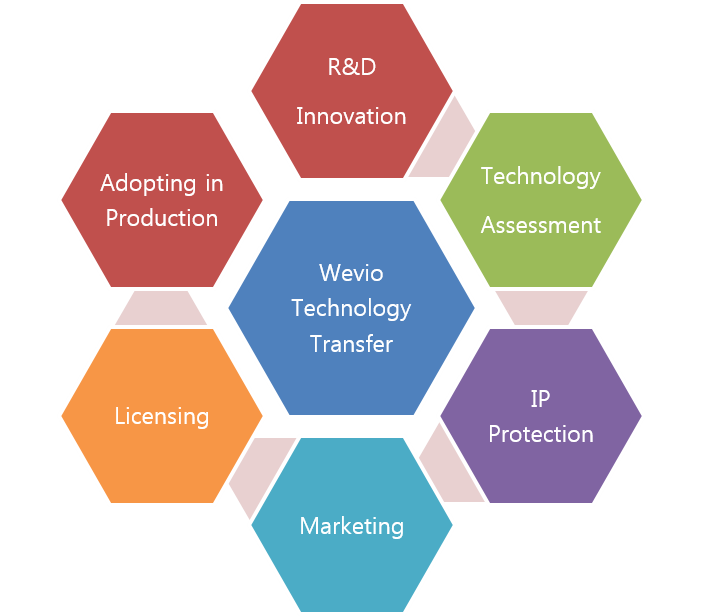 Wevio helps companies to work with R&D organizations and other companies which have superior technology innovations, who can collaborate with pre-established manufacturing firms. Wevio works as consultants between the best technology providers and the companies at various global locations. ProcessWevio helps companies to work with R&D organizations and other companies that have superior technology innovations, and can collaborate with pre-established manufacturing firms. Wevio works as consultants between the best technology providers and the companies at various global locations.